Epic said the tier 1 outfit for Calamity that showed a breast jiggle was an unintended, embarrassing, and careless mistake. 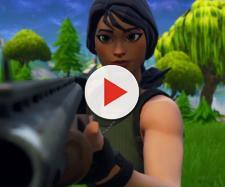 "Fortnite" players over on Twitter soon got word of the short clip on social media and rushed over to have look, where thousands of people are talking about it. The clip that only showed up in her most basic first tier was cheered by some people as the best upgrade ever. Other took it in good humor, and some people were saddened to hear Epic made a fast Calamity breast fix. "HELL YEAH. Best emote in the game got even better," said ‏ @Doootjeee. This was in reply to FaZe Agony who captioned the clip with, "The most important thing in the Season 6 update." On the whole though, the "Fortnite" gamers of the female kind seem to be fun people as there was little chest-beating and bleating about the exploitation of women. But there were a few comments about how fans of the game should remember it's a kid-friendly game. One female account, ‏ @1uzenda, did point out something though, asking, "So guys really get off on animation or is this a nerd thing? Also, is there a [bulge] in the guys? Or is this a sexist thing? When an Epic spokesperson apologized, it was noted that he said the boo-boo was "unintended." Some people speculate that means it was a "mistake." But as Kotaku noted, it would take quite a bit of complex work to make the "physics" so realistic. This sort of thing was picked up on by the Twitterati. As @yagirlkitana noted, "Someone's getting fired." The Verge noted "It’s unclear how an “embarrassing” addition like this made it through the QA process at Epic, but at the very least the developer seems to be acting quickly to remove the animations." Meanwhile, some users felt that the game has so many realistic animations, that they saw nothing wrong with the bouncing bits. Apparently, it's been fixed already. Lots of people noticed that the "glitch" had been fixed soon after Epic posted that they had "disabled animations." Others wondered if it was just a marketing "error" as gamers rushed off to check out the Calamity skin that was supposedly a "boo-boo" and "unintended" in "Fortnite's" season 6 update.